A wide range of technologically advanced products and a quality control lab, for an efficient response to customers’ needs. Our offer includes radial, ball, axial bearings and bushes. Intervolventi’s clients can count on our technical assistance service ever since the design stages, with the aim of finding the best solutions in terms of reliability, inexpensiveness and availability of the product. The capability of following the clients in the choices of personalizing the product and the ability of offering high qualified technical advice during the post-sale, represent the excellence points of Intervolventi’s business model. One of the elements that make Intervolventi different is the accurate control of every production phase, which assures the quality and the certification of the products. To guarantee these high standards, many scrupulous tests are conducted, inside the factory, the lab and the research and development pole. Bearings with rubber seals and tapered hole (2RS K). If the bearings in this section do not meet the load capacities required by your application, refer to the section dedicated to spherical roller bearings, which have the same properties in tolerating misalignments. For more information on lubrication, cages and specifications regarding dimensions, misalignment, tolerances and operating temperatures, please refer to the pdf on this page. Differently from radial ball bearings the angular contact ball bearings can withstand not only radial but also axial loads, unidirectional, whose intensity depends on the value of the contact angle. This feature is given by the contact angle that balls and raceways form between them. The most common angular contact ball bearings are those with suffix B, that is, with a very large contact angle (40 degrees), they are suitable for strong axial loads. These bearings are not separable and allow you to reach remarkable rotation speeds. The angular contact ball bearings manufactured and distributed by Intervolventi are mainly of B type. Further information on lubrication, cages and specifications regarding dimensions, misalignment, tolerances and operating temperatures can be found in pdf on this page. These types of bearings are structurally similar to two angular contact ball bearings but the width is smaller than the coupled ones. This feature makes the double row contact ball bearings suitable for use in cases where the axial footprint is limited; they can hold high axial and radial loads in both directions. These bearings shown in this catalog have all 32° contact angles, are extremely rigid and are suitable for tilting moments. 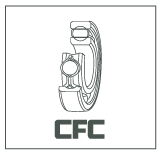 The recent versions of CFC double row angular contact ball bearing are equipped with polyamide cages, larger diameter balls and cinematic improved internal geometries, all to allow for longer life and increased load capacities. Cylindrical roller bearings with cage are made up by two rings (external and internal) and a roller row. Their main features are high stiffness and high capacity to bear radial loads. Cylindrical roller bearings are classified according to the type of side rib that allow to sustain also axial loads. Intervolventi catalogue includes two cylindrical roller bearing types: NU and NJ. NU Cylindrical roller bearings are best suitable for free support because one of the rings is not axially constrained since it has no flange fixing it. Being decomposable, operations of mounting and dismounting become easy. Furthermore, this series has two integral flanges on the outer ring and no flange on the inner ring. Instead, NJ bearings are locating devices, since they carry both radial and axial loads. This condition is valid only in one direction, while in the opposite one they behave as non-locating bearings as they are not constrained. Free end NU bearings cannot be used as locating if they are equipped by HJ ring, since it works as axial guide. Please notice that NU bearings should never be equipped with double HJ rings, otherwise locking can occur. For more information about standard cages for cylindrical roller bearings, please see the attached pdf. Drawn cup needle roller bearings consist in a very thin outer ring, obtained by sheet metal, and a roller cage; they can also are available in full complements design. The distinctive trait of these Drawn cup needle roller bearings is a reduced radial section and a high load capacity, obtained thanks to the high number of rolling elements. They are used when the space available is very small and the surface of the housing is not suitable as raceway for a needle roller cage assembly; they are also appreciated for their economics compared to other solutions. Intervolventi catalog includes HK Drawn cup needle roller bearings with two open ends; for the availability of BK Drawn cup needle roller bearings with closed end for mounting on shaft heads, contact the Intervolventi Sales Service. More information on lubrication, cages and Specifications about dimensions, misalignment, tolerances and operating temperatures can be found in pdf on this page. Needle roller bearings are so called because the rolling elements are made of thin rollers (long and with a very small in diameter compared to the bearing one). Despite the reduced section, these products have a high radial load capacity; they are widely applied where high loads and reduced radial space are required. The needles have lightly discharged external profiles; the modified contact line between raceway and needles makes it possible to avoid dangerous loading concentrations at the ends. Bearing rings are made of 100Cr6 chrome steel; Depending on the application, they can be used with or without internal ring (removable). Spherical roller bearings with two rows are a unit consisting of a massive outer ring with concave and spherical raceway, a massive internal ring and rollers and cage; these products are not separable. Intervolventi spherical roller bearings are produced in three versions; in order to facilitate assembly and dismantling, all types are also available with tapered hole in order to be used with adapter sleeves or withdrawal sleeves. A tapered roller bearing consists in one inner ring with two edges, an outer ring with no edges and one row of tapered roller. Rollers are inclined respect with the bearing axis; the ideal extension of their generatrixes meet the bearing axis and the raceways generatrixes in one point. To avoid contact at the ends, the tapered rollers are provided with a profiled area of connection between the taper surface and the real rectified joint. For technical information on contact angles, cages and tolerances, see the pdf on this page. Single direction thrust ball bearings consist of a shaft washer, a housing washer and ball and cage assembly; they can accommodate the axial load in only one direction and are recommended for medium-low speed. These types of axial ball bearing are separable. In our catalogue you can find the recommended abutment and fillet dimensions. For further information, please contact INTERVOLVENTI Technical Support Service. Spherical roller thrust bearings consist in two rings (one fixed and one rotating), a cage and rollers; they are mainly used to transmit axial loads, are recommended for medium to low rotation speeds. These Spherical roller thrust bearings are separable. This catalog shows the recomended abutment and fillet dimensions. Track rollers and stud type track rollers are similar to cylindrical roller bearings and roller bearings, with high outer ring thicknesses; They are widely used as eccentric, contrasting guides, conveyor wheels, linear motion bearings. They can withstand very high radial loads, as well as axial loads due to misalignment, oblique operation and start-up kinematic settling; are available with or without axial guidance of the outer ring, open or shielded The stud type track rollers are similar to the Track roller with axial guidance, where the inner ring is made of a massive stud; the inner raceway is formed on the latter and the opposite end is threaded. Stud Track roller consist of one or two rows of rollers and needles, full complement or with cage; the outer ring is of high thickness, it is profiled. If they are to be mounted on shaft they have an inner ring, otherwise they are available without inner ring; can be with or without seals. Stud type track rollers are made of a massive profiled outer ring, an internal raceway made on a stud with threaded end, a roller cage or full complement rollers / needles and sliding washers. NATR-PP type have cage; the NATV-PP type is needles full complement; the NUTR is rollers full complement.